The word “Apalachicola” ranks up there with Okeechobee and Massapequa as one of the more amusing Native American place names. It has a foreign air, but just enough grit that you instantly know that the town can be found somewhere on a map of America. In fact, you can find Apalachicola on a map of Florida, in the central-western crook of the Panhandle about two hours south of Tallahassee. Some people call this area of the country L.A. – or, Lower Alabama – and, coming originally from Alabama, I know this to be true. This is the land of NASCAR, country music, and yellow flies. Nine out of ten times, this is the kind of place I avoid. But I was in for a surprise. I’m a self-hating southerner. I was raised in Alabama and North Carolina, but have always thought of myself as a northerner in a southerner’s body. But even though I resist my so-called heritage, there are a few southern sensibilities that I can not shake. Most of all, I’m a glutton for the sun and heat. Apalachicola and nearby St. George Island (where I stayed over Memorial Day) are perhaps the hottest places on earth. I wasn’t surprised to hear that this was the place where air conditioning was invented. Actually, the inventor of the ice machine, lived here. The sun in Apalach, as locals call it, is penetrating, to say the least. Walking out of our cooled condo into each day’s heat was like being cupped between a giant pair of hands and blown upon. The humidity was enough to wilt your eyelashes. We wanted to do nothing while on vacation and didn’t want to feel guilty about it. There is very little to do in Apalach. Go to the beach. Read. Swim. Dry Off. Drink beer. Lay in the sun. Read. Duck under the shade. Read some more. Drink some more. Lunch for two hours. Watch a little French Open. Walk back to the beach and pick up where you left off. Of course, we grew bored by day two. So we went in search of things to do. A long bridge connects St. George Island to the mainland. 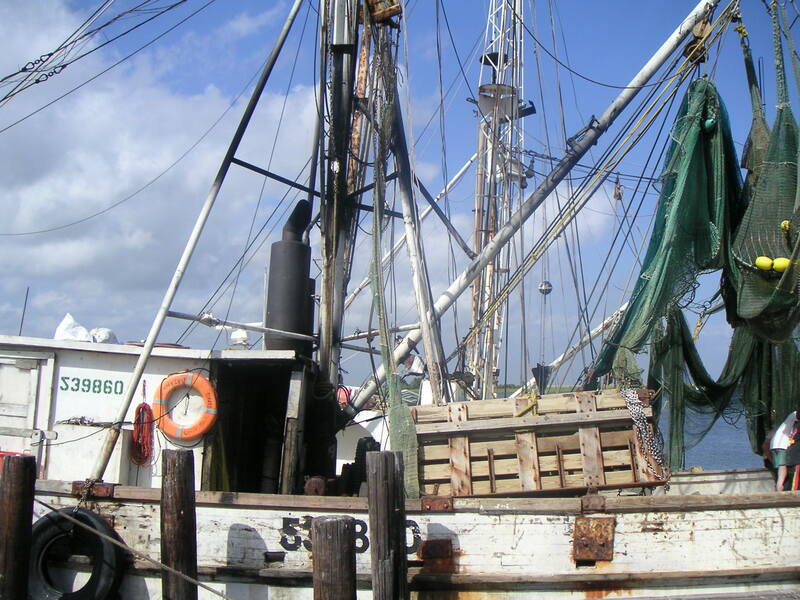 Yet another connects the mainland with the oystering village of Apalachicola. Driving over the first bridge, you get a view of the old bridge, whose middle has now been razed to rest as a reef in the Apalachicola Bay. Driving over the first or second bridge will give you an audience with a squadron of brown pelicans. The way the birds trace the path of your car is fascinating. Were it not for a few cars parked on Commerce Street, I would have figured the place for a ghost town. More than a few buildings have fallen into disrepair or have altogether crumbled. The old jail – a two story stucco building near the docks – was latched shut. Wooden oyster trawlers, about thirty feet high with names like ‘Brianna’s Blessing’ were blistered and losing their paint. Across from the boats, however, was a sign of civilization – rather, yuppiedom. The Grady Market and a set of hotel suites called “The Consulate” sat in an old cotton mill in Apalach’s south end. The juxtaposition of the rural and the “new” South unsettled me a bit. It was a similar feeling to the one I felt when I happened upon an Internet cafe in a primitive fishing village in Brazil. “This isn’t supposed to be here! But, I’m kind of glad it is…” Further investigation revealed there were a ton of these little stores selling antique mantles, Portuguese soaps, and nautical passementerie. This was a Charleston (South Carolina) in the making. But I got there just in time. At Taylor’s Antiques, I bought an old label from a citrus box, a circa-1986 memorabilia 8×10 of New York Knick Patrick Ewing (for $1! ), and a gorgeous, 3-rowed, costume pearl necklace that drips on the neck like candlewax. Give me a thrift store, and I’m happy. In truth, we had gone into “town” to go the Piggly Wiggly. The pearls would have to wait.